Can airlines find their Sweet Spot? With the ongoing convergence of passenger airline business models, it’s worth remembering the fact that despite this convergence, there are distinct differences between the intended positioning of the airlines related to on the ‘front-end’ product and service mix on the one hand and the ‘back-end’ cost structures that the airlines exhibit. The diagram below breakouts four distinct positioning choices available to airlines today. We assume that an increase in features offered to customers should lead to an increase in costs measured as Cost Per Available Seat Kilometre (CASK). The key issue here is for airlines to clearly identify who their target audience are and avoid dilution of the value proposition as far as possible. This is probably the clearest positioning. This type of airline typified by RyanAir or Spirit Airlines is all about keeping costs down and fares down for customers by trimming to the bare bones the service offering. The cost-conscious or budget constrained customer who is looking for a purely functional experience will likely choose this airline. Ignoring fuel costs, this airline can leverage its lower labour costs and simpler fleet structure to offer incremental features and benefits and migrate towards the typical low-cost airline, biting at the heels of these carriers. Low-cost Carriers, once the disrupters of passenger aviation are now well established players offering commoditized and imitable processes and business models. Long gone are the days when Southwest Airlines first offered an entirely new way of delivering value to cynical and exploited customers in the US domestic market. Today, in highly competitive contexts, LCC is the rule rather than the exception. The fact that the model can be easily copied has vast implications for the LCC model. The key questions include: can the LCC model be extended to long-haul flights? Should LCCs move from secondary airports to main airports to compete more directly with the full service carriers (FSCs)? Given that FSCs have embraced a lot of the elements of the LCC model in terms of front-end features, how should the LCCs respond? 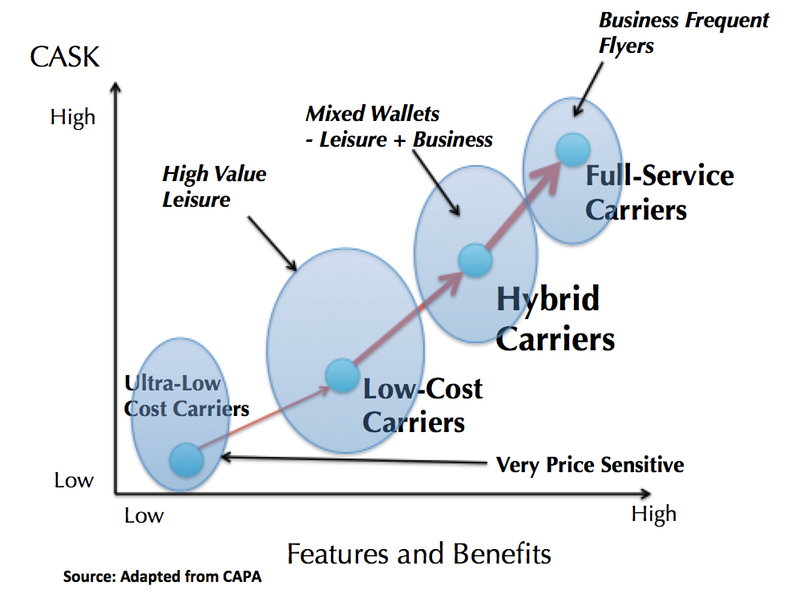 Arguably, the hybrid carrier is the immediate future of passenger aviation. This positioning seeks to maximize its customer base by simultaneously appealing to leisure travellers and price sensitive business travellers. They do this by disaggregating the value proposition and allowing the passengers to configure their choice of benefits to make their budget. On the cost side, the airline seeks to develop a flexible, lower paid workforce; simplifying their fleet and network. They seek to capture some customers from the FSCs by offering features associated with the FSC e.g. lounge access or priority boarding at additional cost to the customer. At the same time, the budget conscious customer can acquire the basic service. This positioning requires a reconfiguration of the in-flight experience. Seating may be rearranged, certain seats may benefit from additional legroom. Flight attendants will offer different services to different parts of the plane, even if there is no curtain dividing the sub-cabins. The greater the level of service offering, the higher the CASK. The main questions facing a hybrid positioning are: who can hybrid carriers create distinctiveness if what they do can be easily and frequently copied? Does it create a stalemate in the value proposition causing the airline to focus on cost reduction instead? The positioning that currently faces extinction in mainstream passenger aviation, is the full-service one. Value erosion in the FSC value proposition caused by uncritical hybridisation from the traditional network airlines has meant that trust in the brand of the FSC has been thoroughly undermined. Crippled with legacy cost structures, paralyzed by the emergence of hybrid-LCC carriers, the default response of FSC executives has been to copy the LCCs and move into hybrid positioning. In the short to mid-haul segment, can we find exceptions? Turkish Airlines for the moment appears to raising their game, continuing to offer hot food, free headphones and in flight entertainment systems. They have eschewed selling emergency exit row seats for extra money and charging to check-in bags. How long can that last? British Airways continues to allow its passengers to bring a laptop bag and a carry-on in economy and offers a substantial snack and free alcoholic drinks. Perhaps what is most interesting here is the threat that could come from an LCC who decides to use its cash advantages to up the game and introduce a premium product on board – at a fraction of the cost of the FSC since they have eliminated many of the fixed asset exposure of FSCs (ground services, lounges) and structural obligations (collective wage agreements and frequent flyer programs). Today airports manage lounges, not airlines. Increasingly airlines no longer manage ground services. It would thus be possible for a hybrid-LCC to make the leap to FSC without the need for investing in new services and ground assets. In short, they could add premium features at a fraction of the traditional costs of doing so. This is a major threat to the network carriers. By uncritically going downmarket on a financially weak basis, the network carriers would have no credible response to raise their game should an LCC go upmarket. We have evidence that this already happening. Air Asia X is a premium hybrid product offering business class type seats and dining. JetBlue has JetBlue Mint that offers fully-flat seats that offers “top-notch service without the four digit fares you might find on other airlines” that includes free wifi, IFE, amenity kits and fine dining. Unlike a start-up seeking to take the high ground, both Air Asia and JetBlue are able to cushion development costs of the new products based on their reliable cash flows from their core hybrid-LCC product. It would thus appear that the biggest sweet spot positioning for the moment resides in LCC positioning – in short to medium haul. In long-haul, we should expect to see greater convergence around hybrid positioning. The weakest positioning in short to medium haul appears to be FSC and even in long-haul, network carriers with the exception of Emirates, Etihad, Qatar Airways and Singapore (who have fully embraced the ‘suite’ concept) appear to be in the process of abandoning the ultra-high end First Class product in favour of economy-premium economy-business class configuration. Again, Turkish Airlines appears to be an exception – having decided to abandon their ‘comfort class’ (premium economy) offering. Whether they decide to go upmarket into a First Class Suite concept is yet to be seen. There will be an ongoing role for ultra low-cost positioning – especially in income constrained India and Africa. Perhaps even a growing role in these tier 2 and 3 markets.